Coming off a 5-4 season in 2007, many media pundits were down on the SM West program. Prior to the season I was amazed at how average of a season many expected SM West to have in 2008. Most of that basis came from the four straight losses that ended the 2007 season, but it wasn't that simply. In 2007, the Vikings lost current star Darron Harvey in game three to a torn ACL. JD Steffen, an all conference performer the previous season, went down in week five of 2007 with a high ankle sprain. The two players were both two way starters and therefore the team lost four positions with those two injuries. SM West was 5-0 when Steffen went down, and went on to face four teams who combined to win 28 games. 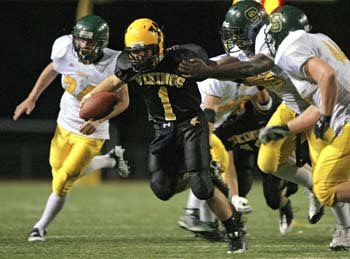 The 0-4 end to the 2007 campaign shouldn't have been as indicative on this current season or the SM West program as many of the preseason polls exclaimed, but nevertheless the Vikings weren't a hot item entering the current season. The Vikings weren't ranked in the Metro Sports Power 25. Nine wins later SM West sits at #4 overall in their poll of the Kansas City metropolitan area. SM West was predicted to finish sixth overall in the conference, but ended up tieing with Olathe East for the top spot in the final standings. Overall the coaches were fairly accurate, but I find it interesting that SM West would end up five spots higher than their originial projection. I think it's safe to say SM West is has erased alot of doubt that existed at the beginning of the season. And the Vikings will be working to make those pre-season polls look even dumber the rest of the way. Photo: DJ Balazs, center, finished the regular season fourth in the Sunflower League in passing yards. Photo courtesy KC Star.